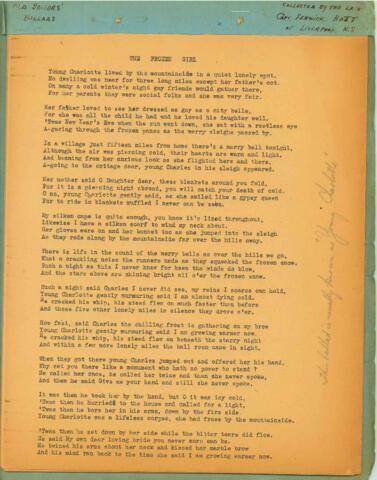 Item MS-2-202, Box 31, Folder 11, Item 5 - "Old Sailor's Ballads, Collected by the Late Capt. Fenwick Hatt of Liverpool, N.S." File contains a transcription of ballads. Includes: "The Frozen Girl," "On the Banks of Newfoundland," "The Worn-Out Sailor," "The Rose of Britons Isle," "The Banks of Brandywine," "The Pride of Glenco," "Sweet Jinny on the Moor," [Untitled], "The Blind Sailor," "The Ship Lady Sherbrooke," "The Cabin Boy," "The Braes of Balquhidder," "The Ramblin' Irishman," "The Desolate Widow," "The Bounty Jumper," "Our Fifer Boy," "The Ghostly Sailors," "The Cumberland," and "Bold Jack Donahue." Includes handwritten annotations by Raddall.